River Ridge is a very average course located about 15 minutes North of Foxwoods in Jewitt City. Built in only 1999, the course is still new so is in good shape still and has distance. The front nine is way easier than the back on this 6800 yd layout, so get off to a good start. They converted an old apple orchard into the first 3 holes so its wide open and flat and should send you out smiling. The back nine has narrow fairways, doglegs and water which makes it tough for any golfer. To score here you may need to lay up often because of the quantity and placement of the fairway bunkers. Tee times can be made on their site. The restaurant is decent and has a ski lodge type of feel. Overall it gets a 6.5 and if you don’t feel like forking over $200 to play Lake of Isles this is a great 2nd choice. This beautiful Tom Fazio designed course is in Ridgefield, touching the NY border. With the perfect amount of water and bunkers this course is challenging but not over the top. The front nine is wide open while the back gets pretty tight and less forgiving off the tees. You will see the beauty of the course right away on the first tee which is elevated on a downhill slight dogleg right. #2 doglegs even more right so make sure you play a fade here. If the tee box is across the pond on #3 then you are facing a very long par 3. 4 and 5 both play pretty easy which is def not the case for #6. This long par 5 is uphill and bends hard left making it a 3 shot hole. #8 is a pretty plain mid length par 4 but for some reason I really like it. Other holes worth mentioning here are #10 a long par 5, #12 traditional par 3 over water,#15 as narrow as it gets, and the long wood bridge between 16 and 17. Tee times can be made on their site or on GolfNow. They have good range to hit up before you play. Overall this course gets a strong 8 and I recommend you play it. Rolling Meadows is a beautiful family owned course located in Ellington which is halfway between Hartford and Springfield. “The first nine holes feature rolling hills and gently undulating greens, while the back nine demands accurate play thanks to the narrow fairways lined with towering trees”. I won’t go hole by hole here as they have one of the best video walk throughs ever on their site. If you had a great front nine I wouldn’t get your hopes up as the back is very tough. Like I mentioned before the fairways are narrow with OB on both sides and the green is often not visible from the tee box. The course is a great place for a scramble tournament and I will definitely be back. my favorite hole there is #3 which is a par 3 over a peaceful little pond. 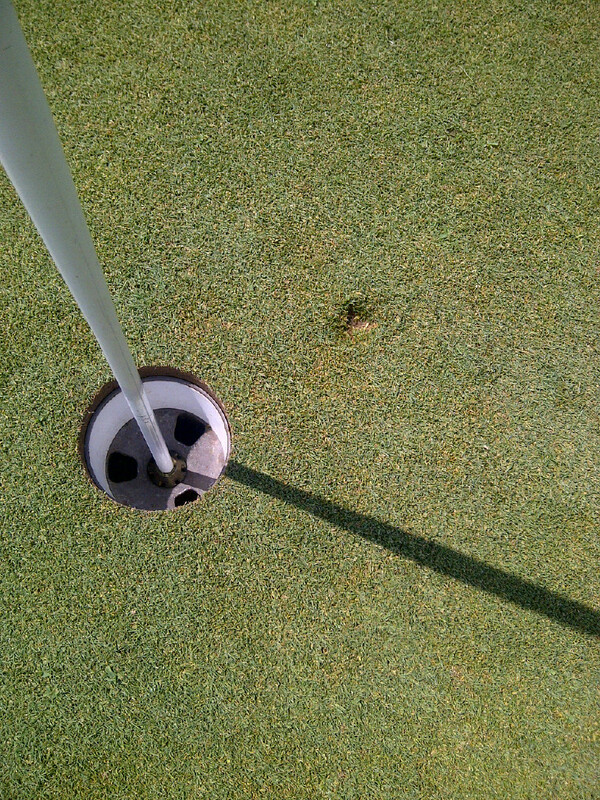 I also love it cause it was my closest to an ace all yr(see pic below). Tee times can be made on their website. Rolling Greens is a beginner 9 hole course in Rocky Hill. As far as rolling greens go I didn’t come across any. The fairways were long and straggly and the greens were long and slow. With many condo complexes surrounding the holes, you feel crammed in but at the same time green to tee box is often a decent walk. Raceway is an average 18 hole course located on the Thompson Speedway property. Hole 6 is the strangest hole in the state. Its a par 5 that doglegs 90 degrees right twice so that the green is adjacent to the tee box. With plenty of water and pot bunkers on front of the green I doubt many get here in 2. My favorite hole here is #12 which is a short par 4 who’s green jets out into the water and is capped off by the halfway house. The view on the 18th tee box is kinda cool even for a non fan of NASCAR like myself. Course gets a 6 but if you’re into car racing I would play 18 before a race or at least hit some balls on their range. Richter Park is often mentioned in the top course in the state conversation. For me in falls in the 5-10 range. Its located on Aunt Hack Rd(sounds made up) in Danbury. The course layout is very nice and its spread out well touching on the reservoir and Boggs Pond. Holes 3 and 5 are great par 3s that require you to carry water the whole way. The tee box on 7 sits all alone on the reservoir on this tough par 5. If you hit your drive 300yds, best bet would be to layup as the fairway runs downhill and to the right into water. My favorite hole here is #12 which is a dog leg right par 5. You need to lay up here as the green is tiny and is almost totally surrounded by water.There are signs marked Humus-quicksand on 15 and 16. Although I always enjoyed Humus and thought quicksand was make believe, they make these holes narrow and tough. After a short par 3 you are sent in with an uphill dogleg long 4. This is where your match can usually be won or lost. They have a great virtual yardage book on their site.